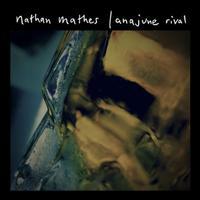 Nathan Mathes, a Wisconsin based singer/songwriter with a handful of self-released collections to his credit, has released his latest effort, Anajune Rival. This eleven song collection is a definite artistic step forward for Mathes, an enormously talented songwriter consistently refining his skill set since his first release, thanks to his restless yearning to mold and reconfigure traditional forms for his own use. However, these aren’t exclusively works of musical art. Mathes’ songwriting flashes with a strong literary flair and command of the language. Mathes can certainly be accused of relying too heavily on studio bells and whistles for accomplishing what his voice and musical skills are capable of capturing without aid. However, his affectations work more often than not and invest his songwriting with theatrical qualities few songwriters can imitate. Anajune Rival is an interesting, though not entirely successful, album. The low-fi acoustic circling of the song creates an introspective vibe that Mathes’ hazy, muted voice matches well. It’s difficult to balance such a threadbare mood with musical substance, but Mathes’ careful weaving of disparate musical elements imbues the track with a stately ambiance. This track takes a distinctly uptempo turn after the opener’s melodic meandering. It never feels rushed thanks to a steady percussive pulse, but the great pocket drumming merely anchors the song. The truly distinguishing quality pushing this song into the memorable is, once again, its tight grip on essential songwriting fundamentals. It has an unassuming build punctuated with rough-hewn electric guitar fills, but listeners will likely find themselves humming the song long after its conclusion. Ethereal harmonies help elevate this track further skyward, but the deliberate piano undertow provides this tune with much of its ballast. This is, essentially, a three instrument duet between the aforementioned piano, tasteful drumming, and Mathes’ haunted vocal. His songwriting shows off a consistent penchant for crafting elegiac musical statements tinged with dreamy regret. Anajune Rival inches close to pure guitar-driven rock with this track, and its contrast with the understated drumming creates surprising tension. Mathes’ multi-tracked vocals are quite good, but sacrifice nuance for vocal weight and the arrangement never resolves itself in a satisfying way. This is piano-dominated and has a sharply retro sound. The echo placed on Mathes’ voice is a production trick listeners will soon become familiar with and, while it works quite well on some tracks, serves to obscure the potential of other outings like this. Despite this, the album’s sonic template remains intact: Mathes focuses on stripped back songwriting architecture and constructs many of the songs like slightly woozy, lyrical flashbacks. What a contrast this is. Indeed, compared to the previous song, this track sounds wide awake. The chiming guitars and brushed backbeat give it a lightly romping feel, and its melodic strengths push it deep into the land of the memorable. It’s more mid tempo echo laden guitar rock, but that isn’t a problem. The problem, however, is that when Mathes switches musical gears, he does so in such a scarcely perceptible way that his nods to subtlety sound, on first listen, like repetition. There’s a lot to recommend tracks like this – the aforementioned weaving of instrumental voices retains the same seamless quality heard throughout the album, but one finishes the song asking if it ever really went anywhere at all. The straight-ahead jangle of acoustic guitar opening the song fits well with another multi-tracked Mathes vocal. The influence of Bon Iver is difficult to escape, but Mathes resists the temptation to weigh down his music with arbitrarily quirky stylistic affectations. The focus remains resolutely on the song and not fills slapped on simply for the sake of being different. This spare, considered piano ballad accomplishes much with only a few instruments. In essence, this is once again a trio performance featuring drums, vocals, and piano and only low key washes of keyboard color add any other sonic elements to Mathes’ canvas. The continuous multi-tracking of Mathes’ vocal, at this point, hints at larger insecurities about his own voice – the device brings nothing to his performances and, if anything, blurs his often fine lyrical content. This track picks up where the preceding one leaves off in some ways. The tempo picks up and the acoustic guitar finesses a secondary choral melody underneath shimmering piano lines. Mood, once more, is everything. Mathes goes to great pains here and elsewhere to create a lyrical landscape through words and music. He succeeds admirably. Everything sounds like it’s one step removed from the listener, yet intimate, like someone singing out your name from just inside the surrounding dark. It takes considerable courage to end your album with an instrumental, but Nathan Mathes has artistic courage in ample supply. This is a largely ambient piece with swirls of keyboards and clusters of piano lines merging to give the track a distinctly neo-classical air. Like much of Mathes’ music, the song is heavy on atmospherics, but they find fitting expression here.